Seedlings of open-pollinated Picea abies families from Norwegian and Central European parent trees standing at three sites in Norway were tested for timing of bud set at the end of the first growth season together with seedlings from control provenances producing seeds at their geographical origin. 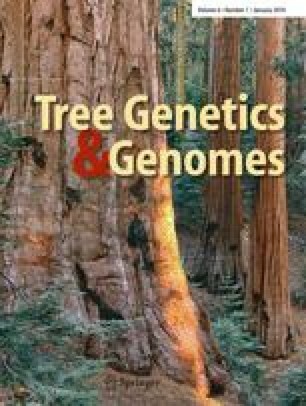 The parental origins were confirmed with a maternally inherited mitochondrial marker that distinguishes trees of the Northern European range from those of the Central European range. The seedlings from the families of Central European mother trees producing seeds in Norway had on average a bud set more similar to the families of local Norwegian origin producing seeds at the same site than the provenance of the same Central European origin. It is argued that the rapid change in this adaptive trait from one generation to the next can be explained by recent research results demonstrating that day length and temperature conditions during embryo formation and maturation can influence the phenotypic performance of seedlings in Norway spruce. This effect may influence the fitness of naturally regenerated plants produced in plantations of Central European trees in Norway. This work was supported by EU grant # QLK5-CT-2000-00349 and the Research Council of Norway Grant # 155041/140. Two anonymous reviewers gave constructive comments to the manuscript.